This sturdy waterproof jacket delivers breathable storm-level protection, ideal for trekking in all weathers, every day of the year. 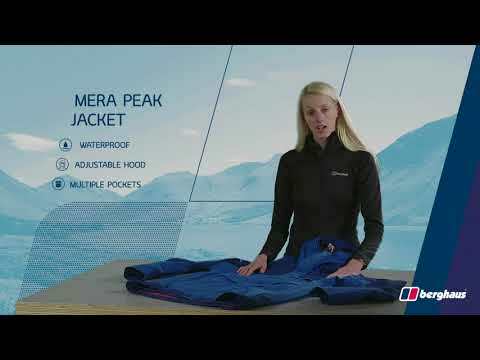 The great looking Mera Peak Jacket won’t let you down when it comes to full-on weather protection. Designed to keep you warm and dry through all seasons its robust GORE-TEX® 2L fabric and storm level construction offers waterproof protection whilst being fully breathable. So no matter how hard you’re powering up those hillsides, the Mera Peak will help keep you feeling comfortable. When the weather lets up, you can roll-up your hood and fold it away using the unique Mera Peak hood design. There when you need it, gone when you don’t. WATERPROOF GUARANTEED - Watch the rain bounce off high performing, 100% waterproof GORE-TEX®. ENHANCED COMFORT - Storm level dry without sacrificing breathability. That’s the magic of GORE-TEX®. WET WEATHER PROTECTION - Adjustable roll-away hood, great for surprise showers. Keep essentials safe in seven generous pockets.